“We communicate who we are with our clothing,” begins the trailer for The True Cost, a newly released fashion documentary. According to the documentary, what we communicate with our fashion apparel is more than we think. 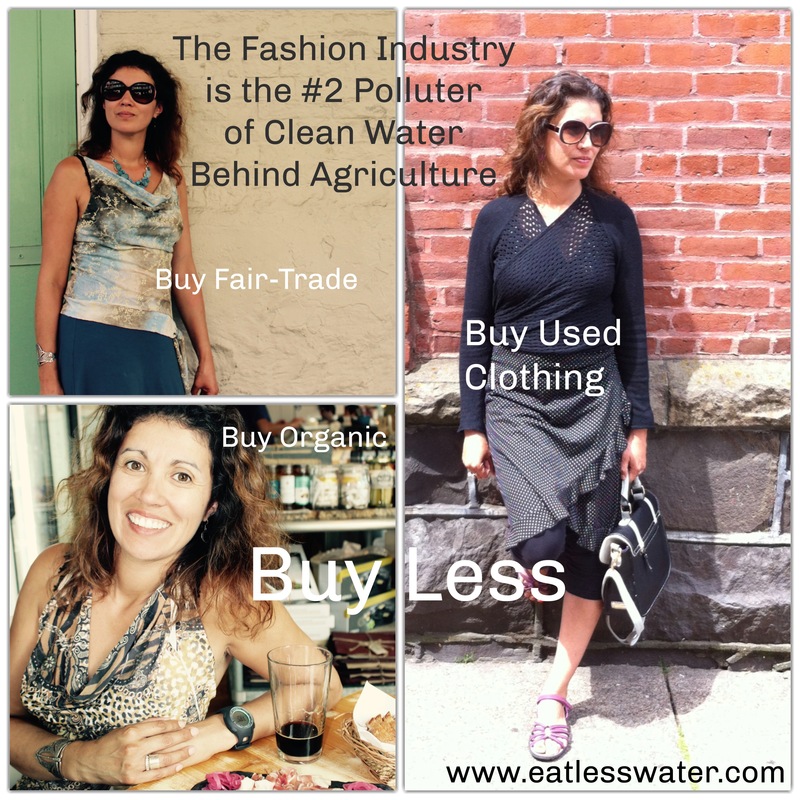 Just like our food choices, our fashion choices matter to water systems around the globe. The water footprint for a t-shirt is 560 gallons of water on average. For a pair of jeans, it is 3,000. The average American throws away 54 pounds of textiles per year, according to The Green Blue Book. We are literally throwing away water and leaving chemicals behind in the environment. The clothing industry, feeding our insatiable demand for clothing, is built on the backs of low-wage workers, too often working in deplorable conditions. 1. Support fair-trade or union labels. You can find a listing of clothing lines with fair-trade labels at www.fairtradeUSA.org. My husband Michael, is a big fan of All American Clothing for his jeans. 2. Buy clothing made from organic cotton. Cotton farms are heavy on pesticides. Ninety-six percent of all cotton grown in the USA is genetically modified. Pesticide applications pollute, water, air and humans. And it kills microorganisms, diminishing the soils natural ability to absorb and retain water. 3. Buy used clothing. I am a big fan of consignment and thrift shops. All the outfits pictured above were found at a thrift store or consignment shop including the topaz color necklace. 4. Buy less. Only a small percentage of our collective wardrobe is recycled. And not all the clothes are ever worn again, instead many end up in a dumpster somewhere in the world. Wear less water! There is power in the collective. The video is very powerful. A pair of jeans = 3,000 gallons of water is hard to understand. I wonder if you can do a part 2 to this topic and explain more about how this is calculated. Good idea Mona. The short explanation for the high water footprint of jeans is the water intensive cotton crop. And not only is cotton a thirsty crop but it is majority GMO, requiring pesticidee applictions. My solution is to buy my jeans exclusively second hand for myself and my children. These jeans are not organic or fair trade but this action decreases the demand of new jeans. My one purchase decision won’t change anything BUT if more of us opt out or demand something different like organic jeans it will change the clothing industry. Those changes will ripple outward to the farm level. There is power in the collective! I just stopped by H&M Clothes and dropped some clothes off over the weekend to be recycled. H&M recycles clothes into such things as sound deadening for cars. While many clothes can be reused, donated, etc., at some point clothes outlive their usefulness. At that point, it is a good idea to have them repurposed into something rather than landfilled. H&M has many retail locations and is happy to receive used clothes for repurposing. That is great to hear Russell. Thanks. Thank you Russel for pointing out this program. This program and others like it solve the problem of what to do with clothing that are too used to reuse. Sending these clothes to the thrift store is the same as sending them to the dumpster. What about clothes manufacturers that use recycled plastics like Patagonia. Also, I am a fitness instructor and need moisture wicking apparel, what would you suggest?